EU President Donald Tusk Says Britain's Demands Were "Pure Illusion"
British finance minister Philip Hammond will try to convince European leaders to include London in any post-Brexit agreement. Europe: European Union President Donald Tusk will on Wednesday finally unveil negotiating guidelines for the future relationship with Britain which warn London it cannot have completely free trade after Brexit. As the EU shows its hand, British finance minister Philip Hammond will try in a speech in London to convince European leaders it is in their "mutual interest" to include the City in any post-Brexit agreement. The crucial steps on both sides of the channel come just days after British Prime Minister Theresa May made a long-awaited speech setting out London's terms for future trade ties. Tusk -- who has called Britain's demands "pure illusion" -- will present the so-called draft negotiating guidelines at a press conference in Luxembourg with the tiny duchy's prime minister Xavier Bettel. The leaders of the remaining 27 EU states must then approve the plans at a Brussels summit on March 22, setting the template for EU negotiator Michel Barnier in trade talks that could start as soon as April. 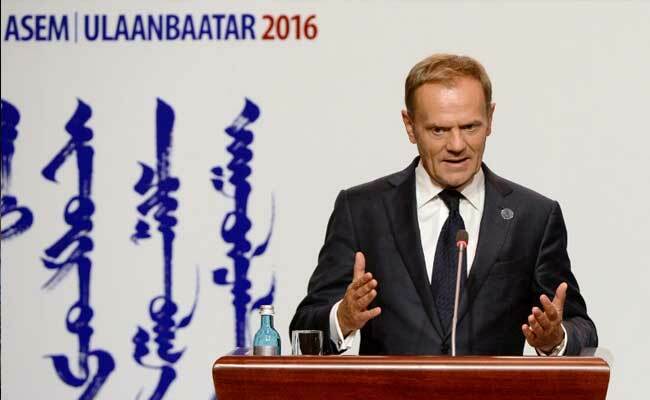 Tusk warned last week that Britain's self-imposed conditions for leaving the European Union -- that it must quit the single market and customs union -- made "frictionless" trade impossible. "Everyone must be aware that the UK red lines will also determine the shape of our future relationship," the former Polish premier said. "I want to stress one thing clearly. There can be no frictionless trade outside of the customs union and the single market. Friction is an inevitable side effect of Brexit, by nature." Hammond however will push the EU to include financial services in any trade deal after Britain leaves the bloc in 2019, a possibility European nations have so far ruled out. In his keynote speech, Hammond will say it is "clear not only that it is possible to include financial services within a trade deal but that it is very much in our mutual interest to do so." "Every trade deal the EU has ever done has been unique," he is expected to say, pointing to prior agreements with Turkey, Canada and South Korea. But a leaked EU report quoted by the Guardian newspaper dismissed similar demands laid out by May in her speech last Friday as "double-cherry picking", and more about managing her restive Conservative party than proper negotiating. The EU has repeatedly vowed to resist all British attempts at "cherry-picking" -- Brussels jargon for getting free access in certain sectors including financial services without the obligations and costs of membership, including respecting freedom of movement of people from EU countries. The tough stance is partly inspired by fears that if Britain gets a bespoke deal it could inspire the 27 remaining member states to leave the EU and demand special treatment themselves. May used her speech last week to call for an EU-UK deal that worked "more fully than any free trade agreement anywhere in the world today", while acknowledging it was time to face "hard facts" about the economic consequences of Britain's shock 2016 vote to leave. The European Parliament -- which will have the final veto on any Brexit deal -- is set to publish its own demands for trade talks later on Wednesday in Brussels. It will say that any full-on trade deal would require a "binding convergence mechanism" with EU laws, Politico Europe newspaper said. London has previously said it will not remain subject to the EU's courts after Brexit. A political declaration on future relations will be attached to the Brexit divorce agreement between Britain and the EU, which Barnier wants in place by November at the latest. Any actual trade deal will have to wait until after Brexit day on March 29, 2019.